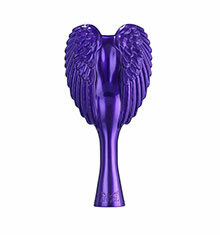 Brushing your hair has never been more rewarding, with Tangle Angel. 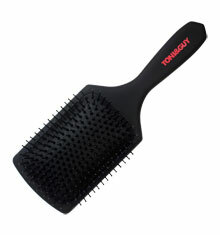 The ergonomically shaped brush, eliminates the reckless pulling and tugging of knotted hair. The contoured bristles are designed to glide through tangles effortlessly without the need for extra force. The miracle brush manages to leave hair silly smooth and easy to manage. 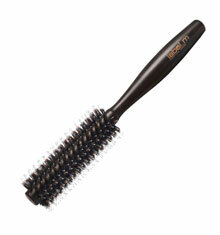 The stunning and innovative brush is suitable to function superbly against knots and tangles. The heat-resistant bristles make it a great styling brush when blow drying too, as the bristles retain their shape even when used around high temperatures. The brush can be held around the wings for greater control or with the handle for daily use, and the anti-static properties prevent flyaways, leaving hair beautifully smooth and fizz-free. Plus, with the antimicrobial additives embedded in the plastic, this makes the Tangle Angel ultra-hygienic reducing 99.9% of bacteria growth! 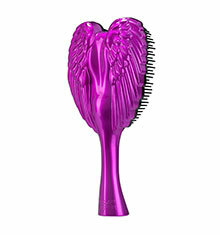 Perfect to use on wet or dry hair, the Tangle Angel is the ultimate tangle-fighting tool. Available in a collection of colours: Gorgeous Gold, Omg Orange, Pop Purple and Totally Turquoise, you'll adore having this multi-purpose brush. 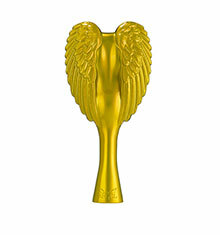 For childrens hair the Tangle Cherub is also available in a smaller size.